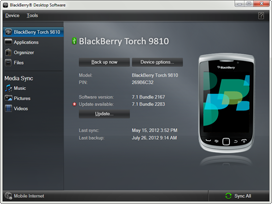 BlackBerry Desktop Manager is the official PC Suite of Blackberry devices and smartphone for Sync information between your device and computer with the help of desktop manager you can update with latest Blackberry of your smartphone and also share data between PC and smartphone. The latest version of Blackberry desktop manager for Blackberry OS 10 has the support of latest Blackberry smartphones and other devices you can use this for updating your Blackberry devices with the latest version. Blackberry desktop software is a free windows PC based application for blackberry users to manage all of there data like pictures, videos, emails, contests and other data with there PC. You can also use this app for official update tool of your blackberry smartphone.